Wondering How to Cope With a Therapy Break? 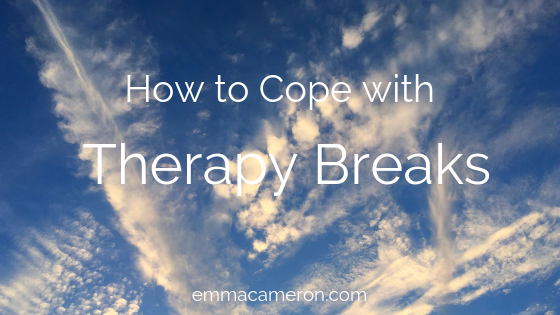 In this blog post I’m going to look at some tips and action steps to help you cope with a therapy break. In my previous post (which you can read here) I discussed some aspects of therapy breaks. If you haven’t read it yet, I suggest you take a look, because it goes along with this post. Now, it’s important to note that not all therapy breaks feel difficult. In fact, some feel like a blessed relief! And other times, you may not notice any particular feelings around missing sessions. But I suspect that if you’re reading this, it’s because there’s a forthcoming (or current) therapy break that feels like a problem. Obviously, there are some circumstances where you and your therapist won’t get the luxury of being able to know in advance that there’ll be a break coming up. But if there’s a holiday or other planned break to prepare for, then you’ve got more time to think ahead. Below are some things you and your therapist might want to consider and perhaps plan to do. During the last session (or the last few sessions) approaching the therapy break, you might do one of the activities listed above; or another one that you’ve decided on. Or you might have no plan in mind. Activities are by no means necessary, It’s absolutely fine to just show up for the session with nothing planned, trusting that feelings and words will appear. To some extent you will probably have internalised your therapist’s voice or way of being, so that you can imagine what he/she might say in certain situations. You can discuss this with your therapist, which may help make it more real and possible as an option. What you feel you have got from the therapy so far. What you look forward to exploring in the therapy sessions when you return after the break. What you think you will miss about therapy/ your therapist while you’re on a therapy break. Your fears about how the break may affect you. And your fears about how the break may affect your therapist. Can you and your therapist come up with some supportive things that you might plan to do to help yourself cope with the therapy break? Does the ‘needy child’ part of you feel cross or scared because the break is happening? It’s okay to talk about this, even if the ‘rational adult you’ knows that your therapist needs to take this break. You might discuss whether it would be possible – or desirable – for your therapist to send you a brief update (e.g. by text) half-way through the break, or after a certain number of weeks. You could think about whether or not it might be helpful to see another therapist temporarily while your own therapist is unavailable. Some people find this helps them cope with a therapy break. However others report that it makes them feel no better – or worse. Your therapist might recommend a book, film etc for you (if it’s well-chosen, it might feel very connecting to know you are reading a book or watching a movie that is a favourite of theirs). You might ask your therapist if they’d be willing to let you know of any local place that they like to go to. Then, when you want to feel particularly connected to them, you might visit that place. Let’s unpack these a little. You might find yourself tempted to ‘act out’ during therapy breaks by doing harmful or unwise things, or by being extra irritable with your partner. Or you might swing in the other direction, pushing down your feelings and trying to maintain a ‘stiff upper lip’ at all times. Maybe instead, you could allow yourself space from time to time to just feel your feelings, and at the same time (this bit’s crucial) practise kindly self-compassion. You might process your feelings through writing. You could even have the child part of you write about the pain, loss and anger (write with your non-dominant hand to access the child part more effectively), and then switch to writing back (with your normal writing hand) from a compassionate, loving nurturing adult part of you. Getting into the habit of doing regular body check-ins (you can read how to do the body check-in here) can help you connect with your authentic feelings. Your family and friends might not realise what’s going on for you. And if you choose to talk to some of them about it, it’s possible that it simply won’t make sense to them. But there is still a lot of value in being around people, even though you probably aren’t having the kinds of deeply connected conversations you may crave. No, these may not provide the same kind of connection as you get in therapy or counselling. But these other ways of connecting with people are nonetheless very valuable and help you keep your nervous system in good shape. A tip that many people find helpful is to become more intentional and mindful about making and maintaining eye contact with friends and loved ones (or just looking at them more, even if not making direct eye contact). And take the time to give and receive hugs and friendly touches to friends and loved ones (always with the other person’s consent, of course). Some people find that stories and metaphors can be very helpful in helping them feel the attachment and bond they have with their therapist that continues even through the therapy break (and beyond). Because the part of you that badly misses your therapist is likely to be quite a ‘young’ part, children’s books may feel appropriate. Some people like to visualise some kind of connection to their therapist, like an invisible beam of light or some other image. Keeping a journal can really help you cope with a therapy break. Perhaps you can set aside your usual session times, to sit with your journal (and maybe some art materials) and do some therapy-related inner explorations on your own. Journalling can provide a structure and containment for your thoughts and feelings. When something comes up that you want to share with your therapist, you can ‘park’ it in your journal for revisiting when your sessions resume. For some creative ideas on journalling, try Lucia Cappachione’s book ‘The Creative Journal’. Regrets are normal. But they don’t have to overshadow the good stuff. Sessions, like life, are imperfect, messy, and have bits missing here and there. It’s just how it is. Please don’t fret about this, or beat yourself up about it with “If only I had…” Instead, see if you can accept the imperfections, and take in the broader picture of the relationship you’ve built up with your therapist. I’d love to read your own tips and experiences about how you have coped with a therapy break. What helped, what didn’t help, and what you’d try and do in future. Leave your comments below! And you can read Part 1 of my series on therapy breaks, here.